Article V Convention Must Be Killed! Legislators, do your own homework on SJR3. Do NOT rely on anyone else. After you have done your own research, you should come to the same conclusion that voting for SJR 3 is un-American and plays into the hands of the socialists. The extreme Left wants to replace our U.S. Constitution and Bill of Rights. None of the 27 amendments to the Constitution have been proposed by Constitutional Convention. A call for a constitutional convention under Article V of the U.S. Constitution is a threat to every American. It is hostile to our constitutional rights and civil liberties. On the surface, all the reasons for having a federal convention sound good… saying, “we need a Federal Balance Budget Amendment, Term Limits, etc.” Some of these so-called good reasons are being used to fool many of the legislators into calling for a Federal Constituional Convention/ Article V convention. It is a smoke screen that confuses the misinformed lawmaker. Legislators, don’t fall for the lies. This alert is a detailed report with information regarding other states and Article V legislation that FAILED, and it includes convention information as well. The following articles are from sources other than Secure Arkansas. They show that States can NOT control the delegates or the process of an Article V Federal Convention. Virginia HJ49 (postponed 2/8/18) & SJ31 (died in 2019): (COSP’s model delegate bills). SJ11 (BBA) defeated in Rules; & SJ26 (BBA)–incorporated into SJ11): both dead 2/9/18. Wyoming HJ 10 (COSP) 2/16/18; HJ3 (one subject) 2/14/18: both dead! Utah– Session closed & the “protected” COSP application was never numbered and introduced! dead! 3/8/18 protected bill “abandoned” on sine die. 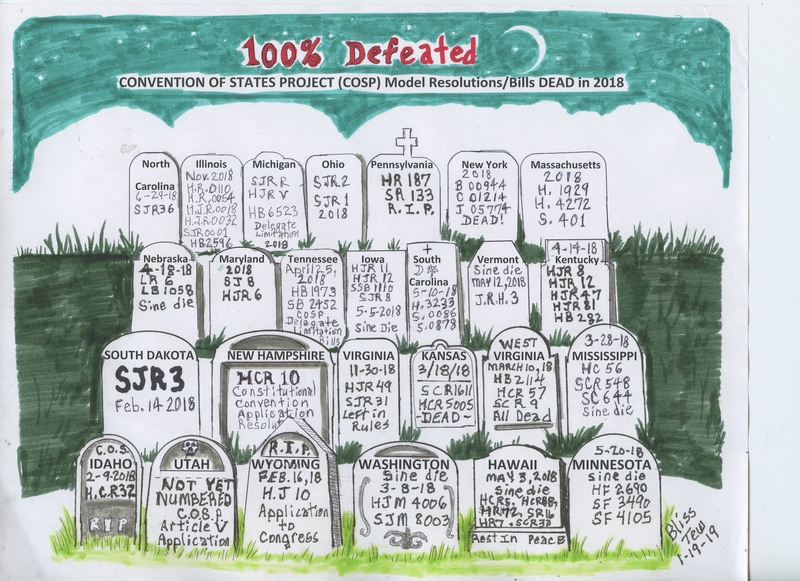 Kansas– SCR 1611 (COSP): dead! Defeated 22-16 on Senate floor 3/8/18 – needed 2/3 vote). HCR5005 (COSP) finally died in committee at sine die 5/4/18. Indiana: Adjourned 314/18. SJR14 (1 subject) dead; 3/1/18: Senate passed SR0042, a bill urging the Legislative Council to assign the CFA topic to an interim study committee. (Required Senate passage only). Mississippi: HC 56 (COSP) is dead! 3/23/18; Others died at sine die 3/28/18: HC31 (BBA); SC509 TML); SCR511 (1 subject); SCR510 (BBA); SCR 548 (COSP); SC644 (COSP). Georgia: 3/30/18 adjourned sine die and failed to pass HR217 and SR195 (TML). SR195 passed the Senate only 3/9/17. Kentucky: HB 282 (COSP Delegate); HJR8, HJR12, HJR 47, & HJR 81 (COSP); & HJR119 (BBA): all dead! HJR12 & HJR47 were withdrawn 1/11/18; HJR8 was withdrawn 1/18/18; HJR119, HB282; & HJR81 died at sine die 4/14/18. Nebraska: LB 1058 (COSP’s delegate bill) & LR 6 (COSP) are dead! LB1058 did not advance 4/5/17 and was indefinitely postponed 4/18/18; LR6 was not prioritized and died at sine die 4/18/18. LR268 (WP) and LR266 (Rescission) died at sine die 4/18/18. Maryland: SJ 8 & HJR 6 (COSP); HJ 11 & SJ 7 (Wolf PAC); HJ 4 (Term Limits): all dead at sine die 4/10/18. Tennessee: COSP’s HB 1973 (SB 2452) model bill to create secretly elected super powerful “Convention of States Joint Committee” is dead! Adjourned sine die 4/25/18; fiscal note killed these. SJR0092 (TML) died at sine die 4/25/18 (and minor bills). Washington State: HJM 4006 & SJM 8003 (COSP); HJM 4017 (BBA); HJM 4003 & SJM 8000 (Wolf PAC): all dead! Sine die 3/8/18. Maine HP1251 (BBA); HP1232 (Term Limits); and SP667 (Wolf PAC) application: all dead! HP1251 and HP1232 failed 3/22/18; WP died 2/13/18 – couldn’t agree what committee to send it to. Hawaii: HCR 5, HCR 88, HR 7, HR 72, SR 16, SCR 33 (COSP); and HCR 207, HR 177, SCR 76, SR 45 (Wolf PAC): all dead at 5/3/18 sine die! Oklahoma: Adjourned 5/3/15 sine die with HB1434 (CFA) and HJR1035 (WP) pending. Arizona: Adjourned 5/4/18 with HCR2024 (TML) pending; passed full House & Senate committee. Colorado: HJR18-1015, SJM18-005 (Wolf PAC): Dead! 4/25/18 indefinitely postponed. Iowa: HJR 11, HJR 12, SSB 1110, SJR 8 (COSP); and HJR8 & SJR5 (Wolf PAC): all dead at sine die 5/5/18! HJR 11 was withdrawn on 3/15/17 and replaced by HJR12; SSB1110 was replaced with SJR8. South Carolina: H.3233, S.0086, S.0878 (COSP); H.3473 & S.0547 (BBA); H.4174 & S.0571 (Wolf PAC); S.0545 and H.3567 (term limits): all dead at sine die 5/10/18! Vermont: J.R.H. 3 (COSP) & J.R.H. 11 (term limits) both dead at sine die 5/12/18! Louisiana: SCR 87 (Wolf PAC): dead at sine die 5/18/18. Failed vote; reconsideration pending at sine die. Missouri: SCR32 & HCR61 (WP); HCR103 (Life); HCR92 (Marriage); SCR48 State powers; SCR91 Repeal 16th and 17th- all dead at sine die; SCR40 (TML) passed 5/17/18. North Carolina: SJR 36 (COSP) was fast-tracked thru the Senate in 2017 with last-minute, midnight hour, or closed-door Committee Meetings which were scheduled so quickly that the People of North Carolina had no time to attend, testify, or adequately respond. It was defeated on a Floor vote in the House; but a few hours later, House Republicans voted to “reconsider” so that it could be voted on during the 2018 Session. But the opposition to SJR 36 (which includes us) created so much controversy, and turned on enough lights in Republican Representative’s minds that the Republican Caucus decided not to call it up for a vote on the Floor. Our letters, visits, and phone calls matter! North Carolina session ended June 29, 2018. Illinois: HR 0110, HR 0054, HJR 0018, HJR 0032, and SJR 0001 (COSP); and HB 2596 (COSP’s delegate bill); all probably dead at adjournment 5/31/2018. But can’t be declared officially dead until after “veto” session Nov. 13-15 and Nov. 27-29, 2018. DEAD at end of year. Massachusetts: An amendment to the Wolf PAC application for an Article V convention (S.2243) which deleted the request for Congress to call an Article V convention, and asked Congress to propose the Amendment, was adopted by the Senate 23-15 and passed the Senate (37-1) 6/21/18. As of 6/25/18, S.2243 as amended is pending in a House Committee. Congress is being asked to propose the amendment [This is the method James Madison always advised us to follow when we want amendments to the federal Constitution.] The COSP application is included with over 30 bills in S.2399 still sitting in Committee and is unlikely to pass during the remainder of the year. MA meets year-round. DEAD at end of year. Washington State: HJM4003 (WP); HJM4006 (COS); HJM4017 (BBA); SJM8000 (WP); SJM8001 (WP); SJM8003 (COS); DEAD end of session. 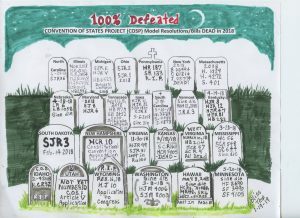 Michigan: HJR V (COS); SJR R (COS); SJR R (COS) All DEAD at end of year. Ohio – HJR2 (COS); SJR1 (COS). All DEAD at end of year. New York: A05109 (WP); B00944 (COS); C01214 (COS); J05774 (COS); S03317 (WP); all DEAD at end of year. COSP hasn’t won ANY states since May 12, 2017! Or Wolf PAC since June 2016, and Balance the Budget Amendment since November, 2017. And NO State ratified Compact for America’s massive new taxes amendment which would delegate to Congress authority to impose a national sales tax and a national value added tax since 2017. Alabama & Missouri passed the term limits application in 2018; but since they had already passed the COSP (which contained Term limits and BBA, it didn’t matter. Note: Louisiana passed a delegate bill this year (HCR 4), but the delegate bill is merely meaningless (as opposed to the virulent delegate bills introduced into Virginia and Tennessee). HCR 4 also doesn’t hurt us because Louisiana had already passed the COSP & BBA applications for an Article V convention. We need to rescind all applications calling for an Article V convention! Warning! : Congress may count the applications however they want – they may aggregate them to get the 34 total, so it is imperative that we stop any new states from passing any “brand” of application and that we get states to rescind their existing applications. 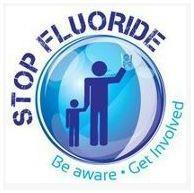 2019 could be a bloodbath, as the mandate for Agenda 2020 draws closer – don’t be complacent, take action!